As Newsom concluded a three-day trip here, he said he’s coming away with a different impression than the one he originally held about the tiny Central American country. He found a country in transition with pockets of prosperity, thriving businesses and a high but decreasing homicide rate, but also a lack of opportunities for too many people. And in any event, it’s not clear how much good they do. One study estimated that the presence of these offices boosted California exports to the host country by a few percentage points — but that it was impossible to distinguish that change from the random ebbs and flows of international trade. Still, Dan Schnur, a former GOP consultant and USC professor, said the trip made for smart politics. The governor met with a former gang member who immigrated legally to the U.S. as a child, later joined a gang and then was deported. He had no family here and ended up joining the gang again, going to prison and finding Christianity — said to be the only reason gang members can leave a gang without being killed. 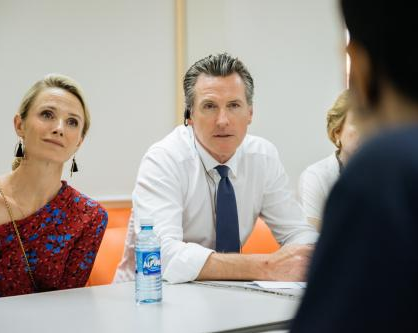 “There’s a story of redemption there, of hopefulness, of restoration, of a life that potentially has new meaning and purpose that can impact for better the lives of people in our country — not just in his own country,” Newsom said. His tone may be directed at those back home as well — both Californian Salvadorans, who make up roughly a third of all Salvadoran-born residents in the United States, and Newsom’s broader political base.